Congenital muscular dystrophies (CMDs) are clinically and genetically heterogeneous and one of the commonest autosomal recessive neuromuscular disorders. It was first described by Frederick Eustace Batten in 1903. The illness manifests in children with weakness, hypotonia, and contractures from birth. In Japan Fukuyama-type (FCMD), represents the most common form followed by collagen VI (COL6)-deficient CMD. , From India short series have been reported on various forms of CMD's. ,,,,, Specific diagnosis and subclassification of these disorders is challenging as histopathology is not distinctive. Immunohistochemistry (IHC) using a battery of antibodies can aid in the specific diagnosis and goal directed genetic testing which is confirmatory. Although CMDs are reported to be common, large studies are very few. Currently, the establishment of a molecular diagnosis is of great importance not only for phenotype-genotype correlation, genetic and prenatal counseling, prognosis, and aspects of management, but also for the imminent availability of clinical trials and treatments. There is a paucity of clinical data from India and hence, this study. The study was approved by the Institutional Ethics Committee. Patients were identified retrospectively from the archived muscle biopsy records from 1997 to 2007 at the Department of Neuropathology of our institute and all data were collected from the medical records. Patients with clinical evidence of very early onset generalized weakness and wasting, contractures, ophthalmologic abnormalities, elevated creatine kinase (CK) level, and abnormal brain imaging consistent with CMD were prospectively recruited from 2008 to 2010, after obtaining written informed consent for all procedures. Muscle biopsy slides were analyzed for routine histology and IHC findings. Cryosections were utilized for enzyme histochemical staining. Paraffin sections were stained with hematoxylin and eosin (H and E), Massons trichrome (MAT), and modified Gomori trichrome (MGT). IHC was carried out using monoclonal antibodies to dystrophin (1, 2, and 3), sarcoglycans (α, β, γ, and δ), merosin, collagen 6, and alpha-dystroglycan (α-DG) as primary antibodies and peroxidase labeled LSAB+ (labeled streptavidin biotin) as secondary antibody. Final diagnosis was based on phenotypic characteristics, muscle morphologic features and IHC findings. The entire group consisted of 102 patients with clinical and histopathological features compatible with a diagnosis of CMD. As 46 did not have IHC studies, they were excluded from the final analysis. Thus, based on IHC, 56 patients could be subclassified into four groups: (i) Merosin negative CMD; (ii) Ullrich CMD; (iii) alpha-dystroglycanopathy; and (iv) merosin positive CMD. The various features are summarized in [Table 1]. Of the 53 patients in whom merosin IHC was done, nine patients were negative for merosin (complete deficiency-8, partial deficiency-1). The male to female ratio (M:F) was 2:1 and the mean age at presentation was 69.7 ± 62.2 months (15 days ± 16 years). Presenting symptom was delayed acquisition of motor milestones in all, except for one male infant who presented on the 15 th day of life with stridor. Seven patients were aged 2 years or above. One patient had undescended testes. Details are represented in [Table 1]. Classical features, multiple contractures, wasting, severe weakness, and preserved mental functions were noted in all the patients [Figure 1]. Mean CK level was 860.5 ± 567.7 IU/l (207-1801). 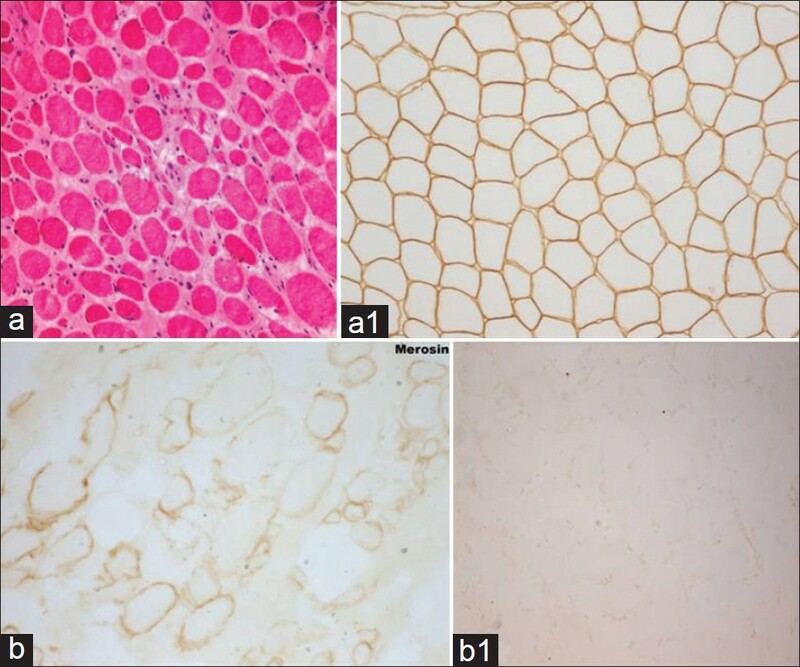 All demonstrated dystrophic features in muscle biopsy with increase in connective tissue [Figure 2]a-f.
Thirteen patients (M:F 10:3) were diagnosed to have Ullrich CMD with deficiency of collagen 6A1 in muscle biopsy. Mean age at diagnosis was 63.7 ± 27.9 months (36.0-108). Onset of symptoms was in infancy in 12 patients. Significant delay in acquiring motor milestones was present in all the patients. Salient findings are given in [Table 1]. Subluxation of joints were reported in three patients. Bifacial weakness, global areflexia, prominent calcaneum, and velvety palms and soles with absent palmar creases were noted in all the patients. Weakness of limbs was more pronounced proximally than distally and distal hyperextensibility was seen in the upper limbs in 11 patients and in lower limbs in nine patients [Figure 3]. Mean CK value was 259.1 ± 109.4 IU/l (117-518). In addition to classical dystrophic features, moth eaten fibers and lobulated fibers were found in four and three patients, respectively. IHC studies using monoclonal antibodies to collagen 6A1 (COL6A1) revealed complete absence of staining in eight patients, and sarcolemmal specific deficiency in the remaining [Figure 4]. There was no difference in clinical or pathological findings between these two groups. Patients diagnosed to have CMD on the basis of clinical findings of early onset limb weakness, hypotonia, and contractures; histopathological evidence of dystrophy and normal staining pattern of merosin, COL6A1, and α-DG were included in this group. There were 31 patients with 21 males. Mean age at evaluation was 58.61 ± 48.4 months (9 months-16 years). Majority (87.1%) had onset of symptom in infancy with delayed acquisition of motor milestones. 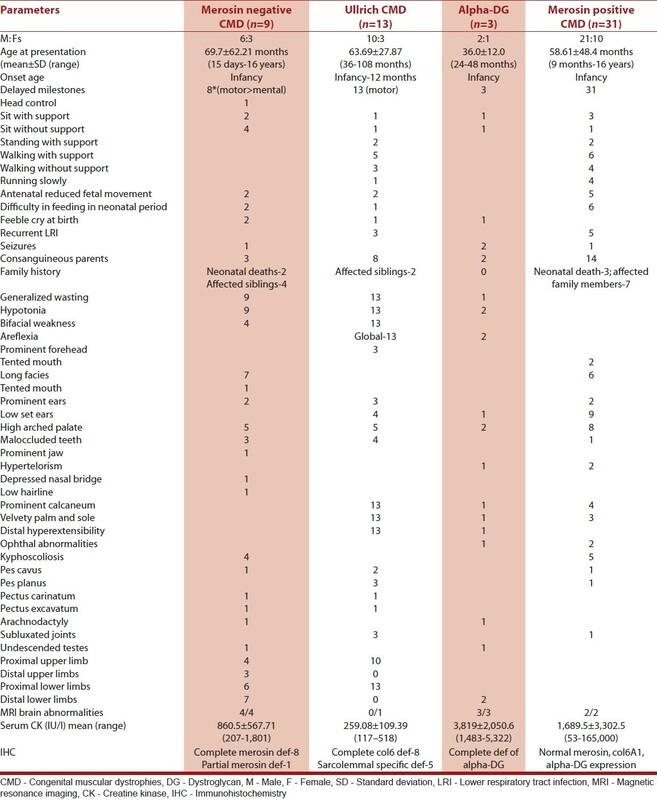 Delay in language and social milestones was noted in five of 28 (17.9%) and in three of 28 (10.7%) patients, respectively. Six patients had feeding difficulty and five had recurrent lower respiratory tract infection. One patient had primary generalized seizures. Mean CK level was 1,689.5 ± 3,302.5 IU/l (53-16,500). There were 10 patients whose CK was above 1,000 IU/l. IHC for merosin, COL 6, and α-DG showed positive staining. Congenital muscular dystrophies are autosomal recessive (AR) disorders, with considerable heterogeneity in clinical presentation, severity, and evolution. The classification of CMD's has undergone several revisions; the most recent one is based on the defects in various genetic and biochemical pathways. Besides it is well-recognized that some forms of CMD's have characteristic features permitting a clinical diagnosis, and which can be further supported by IHC on muscle biopsy and/or genetic studies. , Although CMD's are one of the commonest AR inherited neuromuscular disorders, large studies are very few. Thirteen patients had the classical clinical features of Ullrich CMD and were confirmed on IHC. Ullrich CMD is the second most common CMD described in literature. In our study, this was the commonest type. Our cohort had a uniform phenotype with the presence of proximal contractures, striking distal laxity, generalized thin habitus, global areflexia, velvety palms, and soles with mesh-like creases replacing the major creases of palms and soles and prominent calcaneum. There was no difference noted between patients with complete vs sarcolemmal specific deficiency of Col 6A1. The specific and notable finding on routine histopathology was the presence of clumped and discontinuous collagen. The clinical feature of nine of these patients has been described in an earlier report. Functionally these patients fared better and seven of them attained ability to stand and walk short distances. Merosin positive CMD is a clinically heterogenous group, with milder manifestations and more slow progression compared to merosin negative group. There are no specific characteristics or salient dysmorphic features described in this group. In the current 31 of 56 cases with normal expression of merosin, collagen 6A1 and α-DG were subclassified as merosin positive CMD. Sensitive techniques like immunoblot to detect deficiency of α-DG and genetic studies do help in better categorization of such patients is necessary. Minimal reduction of COL 6A1 may be difficult to identify. In one study, [15b] IHC reduction of COL 6 was observed in only six patients and it was noted that age and presentation at onset, distribution, and severity of weakness and contractures, and frequency of non-ambulant patients were similar in patients with and without COL 6 involvement. Hence, COL 6 deficiency may not be a uniform feature of all patients with Ullrich CMD. In the current study, antibodies to collagen 6A1 only were used. The involvement of other collagen peptides viz 6A2 and A3, cannot be ruled out. Until the last decade, the diagnosis of CMD was based on a combination of clinical signs coupled with the presence of dystrophic changes in muscle biopsy. The discovery of patients with deficient merosin staining and the fact that such patients formed a homogenous group allowed the first classification of CMD's. Thereafter, 13 different types of CMD's based on specific protein deficit and gene defect have been identified. Despite these advances, there are still a large number of patients who fulfill the clinical criteria for CMD's, but do not have defects in the genes described so far. The main drawback of the study is the retrospective nature. Also IHC could not be performed in a proportion of patients due to nonavailability of stored muscle tissue. Genetic testing, which is the confirmatory test could not be done in this cohort. Follow-up was limited which could be attributed to lack of motivation among parents as these disorders are untreatable and also have limited survival. Despite these shortcomings, this study provides a significant data on one of the largest cohort of patients with CMD's from India. IHC has definitely helped us to categorize 56 patients in this study into specific subtypes of CMD. This is essential for directing genetic analysis which is essential for a definitive diagnosis. Further studies are necessary to characterize the natural outcome including survival patterns and correlation with pathogenic mutations in this group of disorders. 1. Batten F. Three cases of myopathy, infantile type. Brain 1903;26:147-8. 2. Mostacciuolo ML, Miorin M, Martinello F, Angelini C, Perini P, Trevisan CP. Genetic epidemiology of congenital muscular dystrophy in a sample from North-East Italy. Hum Genet 1996;97:277-9. 3. Okada M, Kawahara G, Noguchi S, Sugie K, Murayama K, Nonaka I, et al. Primary collagen VI deficiency is the second most common congenital muscular dystrophy in Japan. Neurology 2007;69:1035-42. 4. Bertini E, D'Amico A, Gualandi F, Petrini S. Congenital muscular dystrophies: A brief review. Semin Pediatr Neurol 2011;18:277-88. 5. Kabra SK, Deorari AK, Paul VK, Sarkar C, Singh M. Congenital muscular dystrophy with arachnodactyly. Indian Pediatr 1990;27:298-300. 6. Das S, Gayathri N, Gourie-Devi M, Anisya-Vasanth AV, Ramamohan Y. Variable histomorphology of muscle in congenital muscular dystrophy. J Neurol Sci 1997;149:157-63. 7. Ralte AM, Sharma MC, Gulati S, Das M, Sarkar C. Merosin negative congenital muscular dystrophy: A short report. Neurol India 2003;51:417-9. 8. Garg A, Gulati S, Gupta V, Kalra V. Congenital muscular dystrophy with characteristic radiological findings similar to those with Fukuyama congenital muscular dystrophy. Neurol India 2004;52:496-8. 9. Nalini A, Gayathri N, Santosh V. Ullrich congenital muscular dystrophy: Report of nine cases from India. Neurol India 2009;57:41-5. 10. Bindu PS, Gayathri N, Bharath RD, Mahadevan A, Sinha S, Taly AB. Pattern recognition on brain magnetic resonance imaging in alpha dystroglycanopathies. Neurol India 2010;58:460-5. 11. Dubowitz V, Sewry CA. Muscular dystrophies and allied disorders III: Congenital muscular dystrophies. In: Dubowitz V, Sewry CA, editors. Muscle biopsy: A Practical Approach. 3 rd ed. Philadelphia: Saunders Elsevier; 2007. p. 349-76. 12. Voit T, Tome FM. The congenital muscular dystrophies. In: Engel AG, Franzini-Armstrong C, editors. Myology: Basic and Clinical. 3 rd ed. McGraw-Hill; 2004. p. 1203-38. 13. Mendell JR, Boue DR, Martin PT. The congenital muscular dystrophies: Recent advances and molecular insights. Pediatr Dev Pathol 2006;9:427-43. 14. Tomé FM, Evangelista T, Leclerc A, Sunada Y, Manole E, Estournet B, et al. Congenital muscular dystrophy with merosin deficiency. C R Acad Sci III 1994;317:351-7. 15. 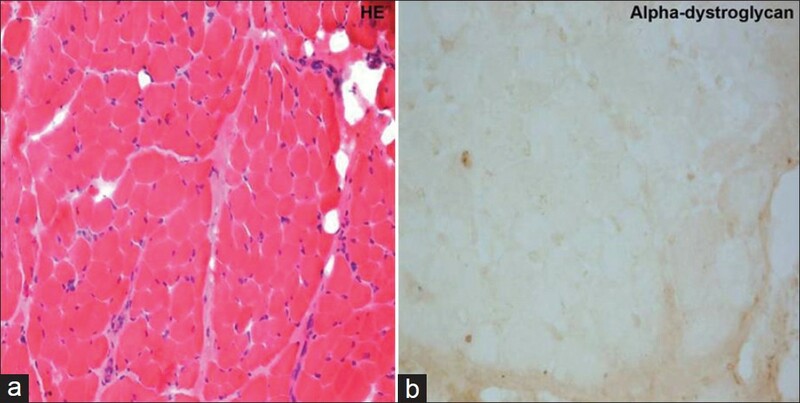 Mercuri E, Sewry C, Brown SC, Muntoni F. Congenital muscular dystrophies. Semin Pediatr Neurol 2002;9:120-31. 16. Mercuri E, Yuva Y, Brown SC, Brockington M, Kinali M, Jungbluth H, et al. Collagen VI involvement in Ullrich syndrome: A clinical, genetic, and immunohisotchemical study. Neurology 2002;58:1354-9. 17. Hillaire D, Leclerc A, Fauré S, Topaloglu H, Chiannilkulchaï N, Guicheney P, et al. Localization of merosin negative congenital muscular dystrophy to chromosome 6q2 by homozygosity mapping. Hum Mol Genet 1994;3:1657-61. 18. Peat RA, Smith JM, Compton AG, Baker NL, Pace RA, Burkin DJ, et al. Diagnosis and etiology of congenital muscular dystrophy. Neurology 2008;71:312-21. 19. Ferreira LG, Marie SK, Liu EC, Resende MB, Carvalho MS, Scaff M, et al. Dystrophin-glycoproteins associated in congenital muscular dystrophy: Immunohistochemical analysis of 59 Brazilian cases. Arq Neuropsiquiatr 2005;63:791-800. 20. Herrmann R, Straub V, Meyer K, Kahn T, Wagner M, Voit T. Congenital muscular dystrophy with laminin alpha 2 chain deficiency: Identification of a new intermediate phenotype and correlation of clinical findings to muscle immunohistochemistry. Eur J Pediatr 1996;155:968-76. 21. Tan E, Topaloglu H, Sewry C, Zorlu Y, Naom I, Erdem S, et al. Late onset muscular dystrophy with cerebral white matter changes due to partial merosin deficiency. Neuromuscul Disord 1997;7:85-9. 22. Muntoni F, Voit T. The congenital muscular dystrophies in 2004: A century of exciting progress. Neuromuscul Disord 2004;14:635-49. 23. Philpot J, Muntoni F. Limitation of eye movement in merosin deficient congenital muscular dystrophy. Lancet 1999;353:297-8. 24. Spryrou N, Philpot J, Foale R, Camici PG, Muntoni F. Evidence of left ventricular dysfunction in children with merosin-deficient congenital muscular dystrophy. Am Heart J 1998;136:474-6. 25. 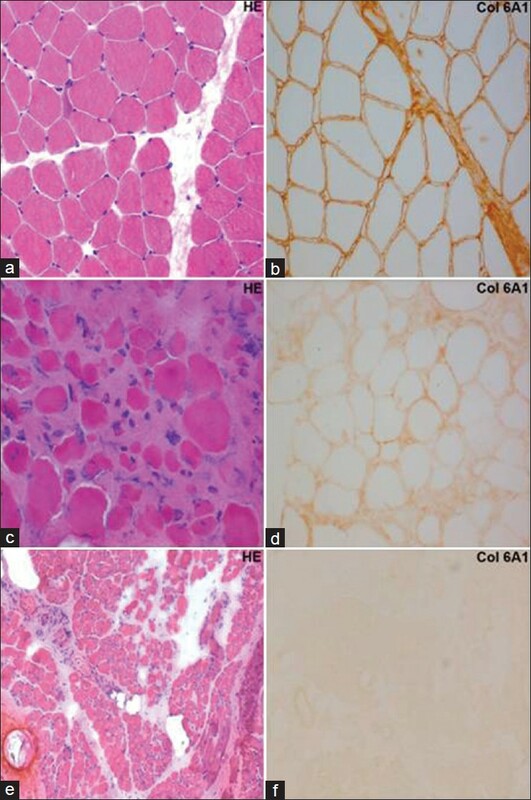 Philpot J, Sewry C, Pennock J, Dubowitz V. Clinical phenotype in congenital muscular dystrophy: Correlation with expression of merosin in skeletal muscle. Neuromuscul Disord 1995;5:301-5. 26. Sunada Y, Edgar TS, Lotz BP, Rust RS, Campbell KP. 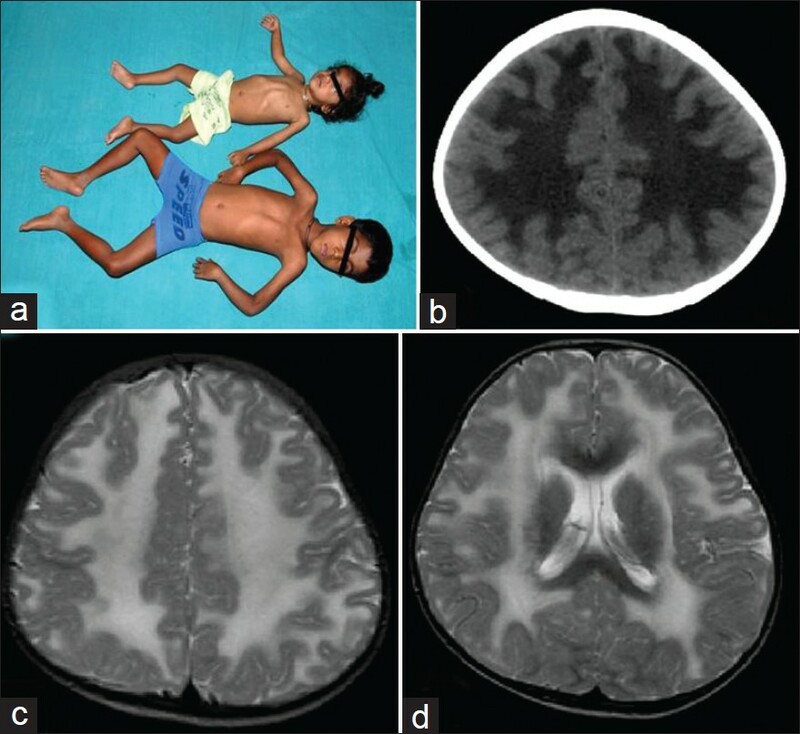 Merosin-negative congenital muscular dystrophy associated with extensive brain abnormalities. Neurology 1995;45:2084-9. 27. Haltia M, Leivo I, Somer H, Pihko H, Paetau A, Kivelä T, et al. Muscle-eye-brain disease: A neuropathological study. Ann Neurol 1997;41:173-80. 28. Kobayashi O, Hayashi Y, Arahata K, Ozawa E, Nonaka I. Congenital muscular dystrophy: Clinical and pathologic study of 50 patients with the classical (Occidental) merosin-positive form. Neurology 1996;46:815-8.